NumeroUnity: But Naturally and Traditionally! They say when a child is born, a mother is born too. Conceiving a baby, nurturing it in womb for 9 months and finally giving birth is indeed, a beautiful natural thing. This dedicated to all those beautiful mothers and their babies and all the care, nurture they do, to bring a life to loving and love. When it comes to nurture, nature is the best mother and nurture is thy second name. Aha! do not take it lightly. The same mother nature can be destructive as well. For if it has reservoirs of natural and herbal products that if taken in right spirit can nurture your body, it also has materials and chemicals that if not used carefully, result in damage. In such contradiction, what comes handy is the knowledge and not just knowledge but traditional knowledge. Tradition has details of each herb, flora and fauna and their therapeutic properties that our ancient humans and saints have closely studied in era of no pollution, no technology yet best natural resources and worked on them century after century. Ayurveda is one such science that approaches towards finding the root of a thing and taking over from there. This science has been perfected over centuries and from Susruta [ doctor for Gods], Charak and all, the tradition still follows. The science, the art of Ayurveda dwells in taking a holistic approach to illness and works on improvement- Mentally, physically and psychologically! The best part of Ayurveda is not in mere healing problems but also help facilitating a healthier way of life on perpetuity basis. The ingredients that are used in Ayurveda are natural and have no side effects that a lot of synthetic products do. They are mostly derived from Herbs, plants, fruits, flowers etc. 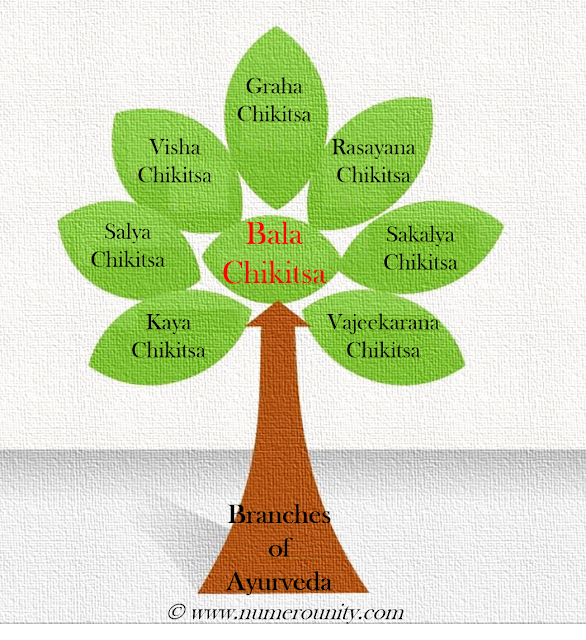 Bal Chikitsa is Ayurveda term for child and nurture related practices, same as pediatrics that we call in modern medicine. It deals with pregnancy and continues with child delivery. This branch needs to be well team up with "kaya Chikitsa" which deals with all things related to body and it's well being. When giving birth to a baby and nurturing is such a natural process, why to ruin it by using products that is not so natural for child? Hence, use of natural oils that are curated using traditional knowledge and therapy for child development. Why traditional knowledge and natural growth? Every thing that is natural and organic, is beautiful. Tradition is a holistic approach towards inculcating organic growth and regular frequency in world to balance the nature. Nature in it's basket has many such splendor things. Being natural is the tradition that comes naturally to a mother. Personally, I love all things natural and traditional. Not as a mindset but it is a logical acceptance towards the boon and benefit that nature bestows on us. Every mother's dream is a healthy baby. A healthy child is a happy child. Health is wealth and early the better. NO matter what they claim, no matter how cheaper or fancy they sound, keep them away from your child and his innocent, budding skin. When I was in school, I have kind of nursed a baby. It was not mine baby but my aunt's new born son- Dhruv and also my maternal uncle's newborn- Ishu. I was really fond of kids. So when my maasi [aunt] became first time mother, I was more exhilarated. I ensured the baby stayed with me 24*7 and I used to be part of all the baby rituals exempting ahem the potty process for obvious reason! My grandma was a skilled and well learned person who knew a lot about natural remedy and care. Every morning, we used to start the baby's day with a rigorous body massage. My grand ma used to use a traditional made oil for the same. As a result of which the children not just took a better body form but remain quite healthy without making frequent visit to doctors. At the same time, my aunt was blessed with another daughter and due to time etc constraints, she couldn't devote a lot of time in massaging her baby with natural oil and would often fall back on marketed and synthetic products, her daughter started losing her immunity and grown as thin as stick as compared to her age. There was a clear difference seeing between the growth of two babies [siblings] wherein one grew twice as faster than the other. The oil was little smelly but that comes from the concoction that is pure natural. Soon we started liking the smell and it was really good during winters. It is 100% natural and traditional. The market is inundated with products...new exotic etc...what make u buy one? lingering fragrances et all. Ayurveda is based on the concept of 3 bio-energies Vata, Pita and Kapha. They provide information about the skin and in the context of holistic view, also provide information on the cause of problem. Sow when you know you have an oil that will take care of the basic needs of your child, help in developing his body, knows his body and target right nourishment to body, why not use a product that is natural, made using traditional knowledge and above all free from toxin and free radicals for skin as tender as baby's. Such a beautiful and well researched post! You obviously wrote this post in a tearing hurry and so missed out on so many interesting facets of ayurveda and the way it connects with growth... you really need to work harder on your writing. But I'm you have the ability. Nice approach. Liked it and best of luck for the contest. Short and crisp. Good luck! Very informative post :) Good luck for the contest. Aha! my hands are shivering with fear as I'm commenting out here :) Well written and all the best for the contest Ekta !! Thanks Jahid. Why are you shivering with fear? Ask your mom to give you Chywanprash daily as you have grown too old for laal tel massage. Loved the you started the post :) All the best! Thanks Seeta! Love to you! Hey, I remember having written the above comment for another entry. Interesting, someone just flicked it and made it theirs. Anyways, I enjoyed reading your post. All the best for the contest! I loved the first line....n of course the post is grt! What is it that sets apart the pros from the amateurs. According to me when I feel like just reading the beginning and the end that's an amateurs post but when its yours I don't have the heart to even miss a single sentence. A post with information and a heart. Simply wow! Thanks for the nice infomercial. Also, do read my non contest post too some time.